Greetings to all our Village plant enthusiasts. Welcome to the 3rd “ Plant of Interest” article for 2016!! This week we’ll be looking at a member of the Asphodelaceae family. Kniphofia triangularis subsp. triangularis (Manderin Poker in English, Motosi in Sesotho) is a monocotyledonous perennial herb that occurs in the Eastern Cape through to KZN at altitudes of up to 2500m A.S.L. 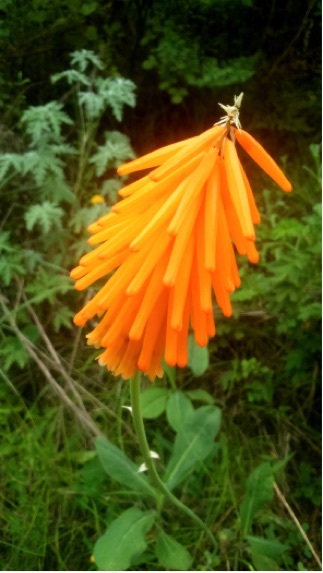 As with most species of the genus Kniphofia, the Manderin Poker is most suited to moist grassveld, nearer vlei’s and on the banks of mountain streams. 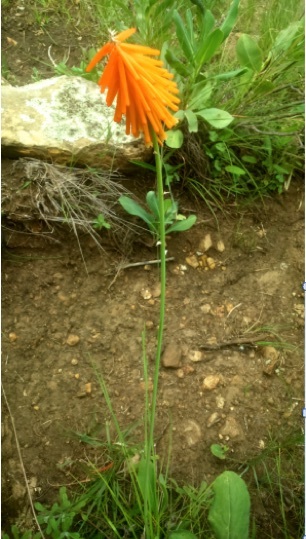 The specimen pictured here was photographed on the banks of a small stream on the Kloof Mountain Trail where, in this instance it grows in solitary, or otherwise in small groups. The leaves are narrow and grass-like, measuring approximately 500-600mm long by 2mm wide, with relatively smooth margins. The inflorescence is a roughly triangular/wedge-shaped spike (80mmX50mm) atop a narrow stem of 600mm. 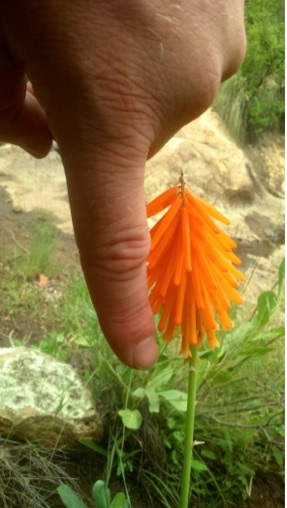 The individual tubular flowers are a vivid orange, measuring 20-40mm X 4-5mm. Flowering is usually from December – February; however because of the dry summer and late rains associated with El Niño and La Niña respectively, these have only been observed to flower from around early February, well into March. Frequented by butterflies and other pollinators, this species plays an important role in maintaining the ecological diversity of wetland areas throughout its range. Kniphofia triangularis subsp. triangularis makes for a dainty yet attractive garden ornamental. When planting from seed, make sure to plant in moist, well-drained soil in full sunlight. A light mulch layer may be needed for its first year in the Free State where frost is common in winter. Classified by SANBIas of Least Concern (LC).